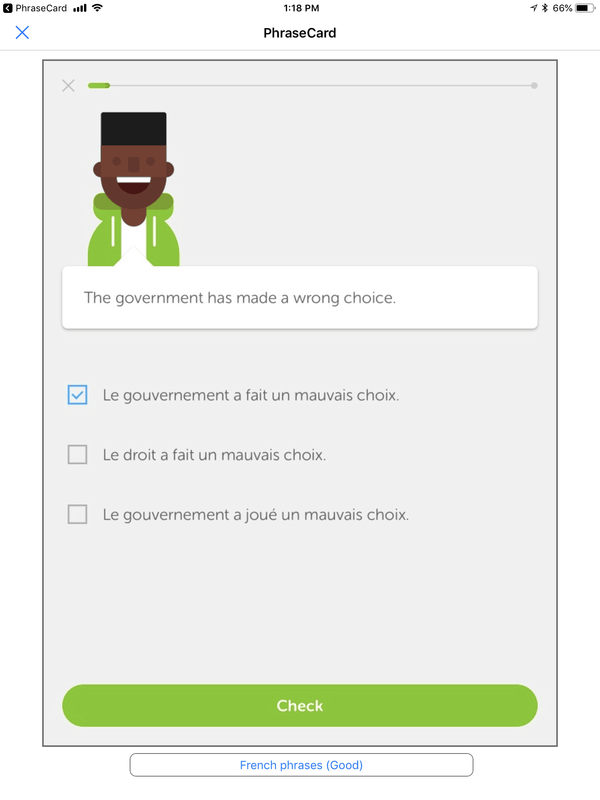 Since I’ve started using Duolingo, I occasionally save a phrase that I think might be worth remembering. I save it very simply: by taking a screenshot. I do this because I think it will be helpful, for the learning process, to memorize some phrases as well as run through the app normally. What I’ve been doing is occasionally going into the Photos app on the iPad and scanning through the “flashcards” I have thus created. As the number of phrases increases, it has occurred to me that a random flashcard app might be useful. This is, of course, easy to create in Pythonista. 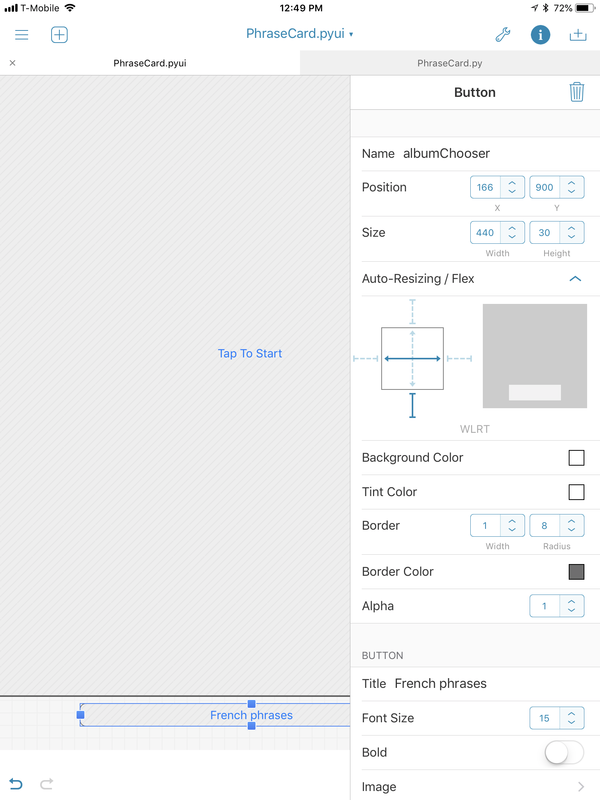 In the interface builder, two elements are required, a button to show the image and a button to choose the album to get the images from. The overall view I’ve set to 768x960. The two titles—Tap To Start and No Albums Found—are defaults; the image where the flashcards go will initially not have an image in it and will say “Tap To Start”. Once an image is chosen, that title will go away, by setting its title to an empty string. The button that holds the displayed image. The button that lets you choose which album to use. On my Mac, these albums are smart albums: I mark all Duolingo screenshots as either French or Italian and as flashcards using keywords. I also use ratings keywords for 1 star, 2 star, 3 star, 4 star, and 5 star. The latter three correspond to Good, Very Good, and Great, which means I can focus in on those phrases I most want to learn. Always good to be able to speak vaguely but wisely. The first line selects the current album, and the second line unhides the drop-down. When an album is chosen, the delegate hides the drop-down again. A new flashcard is displayed whenever I tap on the flashcard display area. That’s why I made it a ui.Button rather than a ui.ImageView. First, it gets the album, using the title of the albumChooser button as the key for the albums dictionary. Then, it chooses an image at random from that album’s assets. If (as should be the case in a flashcard album) there are more than one image in the album, it also makes sure that the new image isn’t the same as the old image. Finally, it asks the view to replace the image with the new card and makes sure that the flashcard display area no longer has a title. You can, of course, download the zip file and install it yourself in Pythonista (Zip file, 2.9 KB) if you wish. This code can, of course, be used to display the photos from any album at random. If you’re using it for something other than phrases, you’ll need to change the way that the app collects names of albums from your photo albums. As long as getAlbums returns a dictionary of albums, keyed off of the album title, the rest of the app won’t care. I had a strong sense of nostalgia while building this app. The very first program that I wrote for public consumption was a Spanish flashcard program in BASIC on the TRS-80 Model I. It was “RS-80Tay, Aysay, Hatway?”1 in the February, 1982 issue of 80 microcomputing. It was the same basic idea, albeit with scoring and quizzing: input phrases, and then have the computer quiz you on them. Pythonista elicits, for me, a lot of the same sense of wonder, excitement, and immediacy that programming with BASIC did in the eighties, and programming with HyperCard did in the nineties. Whenever I think of something really useful that I ought to be able to do with the iPad, and there’s no app for that yet, it’s fun to make it in Pythonista. Whether it’s on-the-fly data collection and analysis or augmenting everyday blog reading, I can think of a potential solution, fool around with it without hurting anything, and see useful results immediately. No, I did not choose the title. I wanted to call it “La Computadora Internacional”. 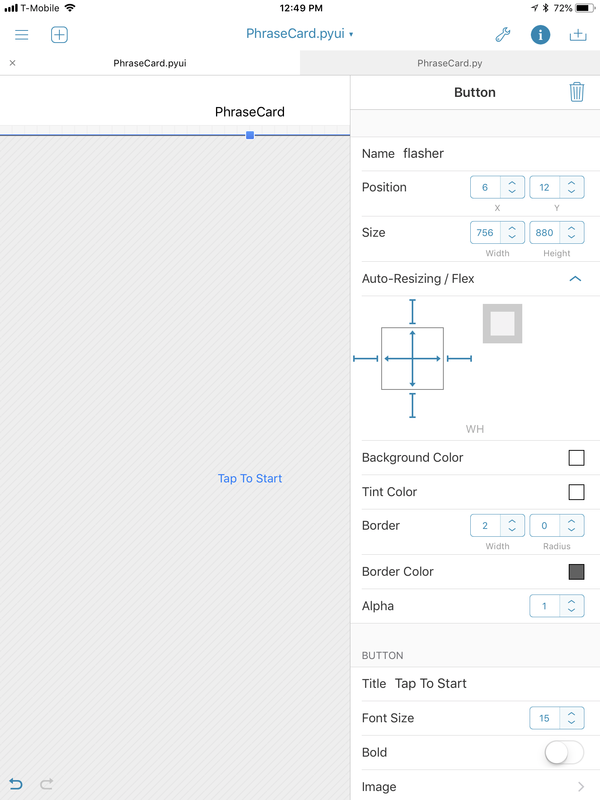 A flashcard program for the iPad, using Pythonista. It displays images at random from specific photo albums. Are your dice biased? Perform on-the-fly chi-square tests using your iPad or iPhone and Pythonista. I now use Pythonista’s sharing extension to ensure that comments on other people’s blogs are appropriately formatted. Scholars once believed that, or seriously discussed whether, Hebrew was the first language of mankind. In a fantasy game, there really can have been a first, holy language of the gods. Use Pythonista on the iPad to import a map screenshot, tap three points, and draw a circle from those three points. This simple shell can be used for other on-the-fly programming, too. Flashcards for iPad using Pythonista last modified November 5th, 2018.